Hello my polished friends! 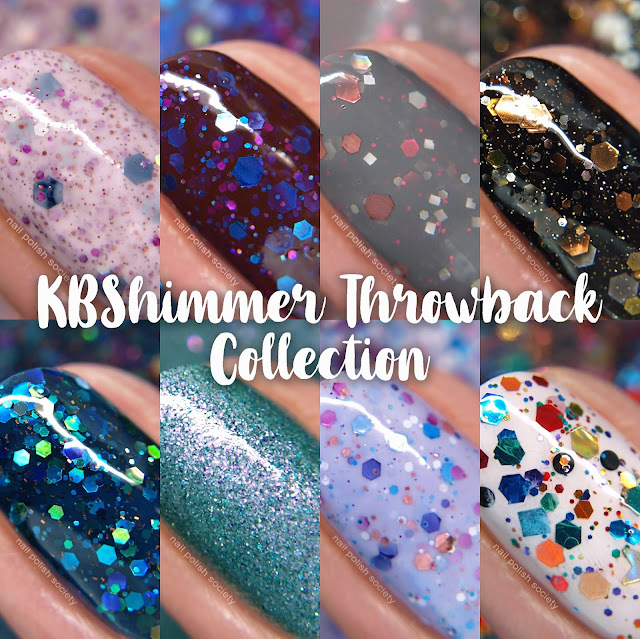 This month KBShimmer is celebrating 10 years (!) in business. As part of the festivities they are releasing a limited edition throwback collection of eight of their fan's favorite shades from 2012 and 2013. The formulas are new and improved while still staying true to the originals. The release of this collection is really exciting for me because I never had the chance to try the originals! I started my blog in 2013 and I was just barely getting acquainted with indie brands. Whether you're a long time fan or late to the scene, I think you'll like these too! Berry Patch (2012) is a creamy pink base with blue undertones with large blueberry hex glitter, small raspberry hex glitter, holographic pink glitter, micro strawberry red glitter, raspberry pink glitter and holographic sliver glitter. This formula was thin and easy to apply. The large glitters are more sparse but I didn't have to do any fishing. Shown is three coats plus top coat. No Whine Left (2012) is a deep plum/burgundy wine crelly loaded with blue, aqua, fuchsia, and purple hex glitters in several sizes. The glitter is plentiful and it built up to opacity nicely. Shown is two coats plus top coat. Elle (2012) is a pale grey crelly, with several pink glitters, and white and grey glitters. This had a nice formula and easy application. Shown is two coats plus top coat. Band Geek (2012) is a black jelly base with several sizes of silver, copper, and gold glitters. The black base gives this a lot of depth and it was hard to photograph all those glitters that are visible. Shown is two coats plus top coat. Teal Another Tail (2013) is a dusty teal green with a strong pink, almost duo-chrome shimmer, and micro holographic glitters. It's a perfect mermaid shade! This polish can be worn without top coat for an almost velvet look, or apply top coat to bring out the shimmer. Shown is two coats plus top coat. Shipwreck (2012) is a deep teal jelly base with several sized hex glitters in teals, blues, greens, purple and gold, and tiny copper glitters. I love the combination of glitters and the formula was easy to apply. Shown is two coats plus top coat. Iris My Case (2013) is a soft purple base filled with glitters in pink, purple, white, periwinkle and blue. The formula was good with a nice distribution of glitters. Shown is two coats plus top coat. Clown Puke (2012) is a clear base glitter topper with a countless variation of glitters in different sizes, colors, bar, hex, round, square, holographic, matte, etc, etc. With such a wide variation, each bottle, each batch will be slightly different. I know this polish used to be very popular and I can see why! Shown over a white base polish with top coat. The Throwback Collection launches August 15th and each polish will retail for $10. This collection is limited edition so don't put off your purchases for long! They will available through through the KBShimmer website, Harlow & Co., Color4Nails, and Amazon. Did you own any of these original polishes? Which ones are standing out to you? My top picks are Teal Another Tail, Shipwreck, and Clown Puke.